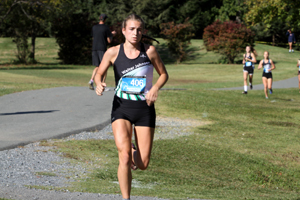 The Walter Johnson girls team won its fourth consecutive team county title and Abigail Green won her third consecutive individual title. In the last four years, WJ girls teams scored 58, 48, 54, and 50 points at the county championship meet, respectively. "I hope it means something to these girls and that it is something they are proud of," said head coach, Tom Martin. "For me these things are just markers to express how hard they work and how good they've been over the last four years, so I hope they are very proud of that." WJ's Janet Scott spoke on four consecutive team county titles: "It's so amazing," she said, with an inflection of awe. "...It's just so inspiring. It just means a lot to me almost as much as winning states four years in a row just because this is something I can think about whenever I'm having a bad workout, like, 'I'm part of something that's been going on for so long.'" Emblematic of Walter Johnson's success through hard work, Scott placed 33rd, 17th, 11th, and now 2nd at the Montgomery County Championship Meet in the past four years. Head coach, Tom Martin, referred to Scott as the quintessential "amazing teammate." Three-time county champion, Abigail Green was quick to cast the spotlight back on her teammates. Said Green, "My main goal was just to come out here and run a good race and hopefully go for the win. I thought it would be really special if I could end it with a third county title, but of course it was a bonus that I see Janet right behind me finishing second. That's just absolutely amazing. I feel like as a team we all really ran well here so I'm just really happy that we were all able to get a really good start to our postseason." Scott, in turn, credited her teammate, Jenna Goldberg, for giving her the confidence to run with the leaders. Said Scott, "I was running with my teammate Jenna which helped me so much. The two of us were attacking each of the girls together. I passed Nandini [Satsangi] and I saw Abbey and I was like, 'I can do it,' and I just kept holding on to her." Green's first place time of 17:57.2 was the second best time ever recorded on the Bohrer Park Course behind her meet record of 17:46.6 from last year. 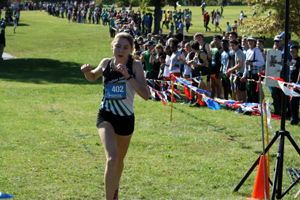 Scott's runner-up time of 18:44.8 makes her the ninth fastest performer on the course (one performance per athlete). Green, Scott, and Goldberg finished first, second, and sixth respectively. Seniors Sophia Scobell and Sadie Keller rounded out the varsity five, all in the top thirty. For the record, the lowest score ever at the Montgomery County Championship Meet was the 27 points scored by the 1999 Walter Johnson girls. 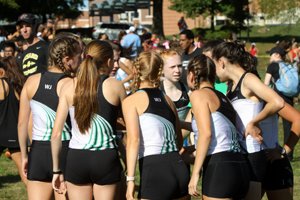 Walter Johnson surpassed Whitman as the winningest girls team in meet history. WJ now has ten county titles and Whitman has nine since the first scored meet in 1978.